I expected after 3 months in Seville to be more or less fluent in Spanish, to gain greater confidence in myself and my language abilities, I also expected the lessons to be partly in English. After 4 ½ months in Spain I wasn’t fluent in Spanish but I do believe it is possible if you work super hard and only speak Spanish. The fact that all the lessons are in Spanish and Spanish only is fantastic! I have definitely come home with a lot more confidence, and lots of new friends! In general I expected the whole trip to be a lot easier than it was, but this wasn’t necessarily a bad thing….. it’s all part of the adventure! 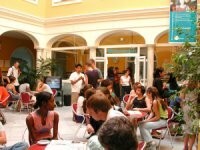 The language school in Seville was lovely, bright and airy, really comfortable and all the staff were very friendly and smiley. The school is in the perfect location, right in the very centre of everything, with a perfect street with breakfast bars right up the road. The school made a really big effort to provide the best activities for the students. During my first week, a group of us went to the Carnaval, all the staff were dressed in costumes and taking over the dance floor! I only ever went to one excursion, to the Musee de Belles Artes. A Spanish guide shows you around and makes an average museum seem very interesting. There was a perfect balance between the amount of lessons and free time we had, but both went too fast. It was fabulous having a mix of younger and older students on the course from all sorts of different countries, it made everyone really enthusiastic about being in Seville! Everyone I mixed with at the college were really friendly and lots of fun. I spent my last two weeks travelling around Andalucia and even though I am obviously biased, Seville is the best place by far. Eating out is good and also cheap, but you need to search for the best Tapas bars because there are so many. Local people were surprisingly friendly, seeing as there was so many foreign students around. The nightlife is fantastic; we started the nights out with a few drinks in the Plaza (the done thing to do in Seville, plus cheap and sociable) and then went onto one of the bars or clubs along by the river. During the day, siesta time is a super safe time to walk around the city. We spent most of our time down by the river, sunbathing again another sociable place to be. What about my accommodation? I stayed with three host families during my stay in Seville. The first lady was fantastic; she was really chatty and friendly. There were two American students staying with her as well as me, she always cooked us good food and you never left the dinner table feeling anything less than full. My second host was a little disappointing, as I didn’t really see much of her, but the last hosts I were again fantastic. They were a really chatty and friendly family. Perfect for making you feel at ease when practising the lingo. The flat was lovely with a gorgeous terrace outside. My most memorable moments are on a paddleboat on the river, sunbathing on the terraces, seeing the Alcazar, times spent in Alfalfa. Watching the women dance at feria, and lunchtimes at the school when lessons have just finished.